The first thing I noticed, as I began paddling into the frigid shore breaks of Lake Tahoe, was that I was not tasting salt and my eyes were not burning. The next thing I noticed was a distinct taste of blood in my mouth and nose. I have no clue if this was from the cold water temperatures or the mineral contents of the lake. I definitely was not bleeding and I’ve surfed in waters just as cold, so I will let a knowledgeable reader figure that one out. Sitting in a beachfront parking lot of Incline Village, Nevada, I wondered if the waves I saw were prime breaks for a Lake Tahoe surfer. The wind howled and snow ripped through me every time I stepped outside to take a leak. I was waiting for nothing more than some sort of sign telling me to go ahead and suit up – I was banking on this sign coming in the form of fellow surfers ready to get in. I noticed that many folks came and went throughout the morning. I couldn’t tell exactly why so many people were coming and going. Eventually two cars pulled up near me, containing guys with boards; I figured this was it, until they quickly pulled away in unison. Finally an Xterra with two guys pulled up. They hopped out and began to check the surf with the most insanely stoked looks on their faces. Though I saw no boards, I knew that they were there for the same reason as me. After a greeting and a short exchange of words, I found out that today was an outstanding day for a regular basis Tahoe surf chaser. I threw on my 5/4mm hooded suit, my gloves, my booties, and then an extremely worn down 4/3mm that is now probably the equivalent of a 2 mil. After a few minutes of missing waves and fighting to position myself I realized that I was much farther out than I had figured. Along with that I noticed that there was a nasty tide pushing me up the lake shore at an impressive rate. Right then I realized that Lake Tahoe is a break that needs to be figured out, just as any other saltwater or freshwater wave. A code to be broken and a puzzle to be solved. Sporting two wetsuits, I paddled through the unpredictable chop as snow and chilling winds tore through my eyes – If I had the choice, I might have even stuck with the stinging of salt water, but I’m not complaining. An occasional four foot close out would sneak up on me and shoot me back farther than many ocean waves ever have; I guess I just didn’t expect that I would have to be doing any duck diving in such seemingly small waves. Maneuvering in the double wetsuit combo was a tiring task. I could hardly stand up or even paddle without sucking wind and getting a little too warm. After my first successful Tahoe ride, I made the trip back to shore and ditched the worn down suit. I was now feeling about a hundred pounds lighter. The novelty alone of riding a freshwater wave gave me an indescribable feeling of satisfaction. After my first decent ride I couldn’t help but let out a laugh. Trying to paddle back into the larger waves was a mess – I was getting torn apart by a mixture of snow, wind, choppy waves, and walls of whitewater… well, maybe not torn apart, in comparison to the Northern California Coast, but it was definitely a new unique form of aquatic discomfort. There is no doubt that there were some rippers in the water. Not only could they surf, but it was clear that they understood where to go and what to look for. I was initially a little embarrassed by my inability to surf this break the way that others were. By no means am I a good surfer, even in the ocean, but I always end up squeaking by with a few good ones, and out there I feel like I pulled off enough to earn my Tahoe surfer stripes– in a lineup of about five dudes, the weakest link usually stands out. In this case I was on the lower end of the spectrum. Although I wasn’t showing off my surf prowess like I had planned, I still got the nods and shakas I deserved just from paddling out in the frigid temperatures. Needless to say, the vibe was extremely friendly, and I could practically smell the pure stoke in the air, due to the rare occasion. As I retreated towards the series of docks on the shore, I watched a fellow surfer begin his trek into the waves. Attempting to fight the sweeping current, along with the snow, his Costco brand soft top was aggressively shaking due to the rough water we were paddling through. It was like watching someone fight to contain their frantic leashed dog. 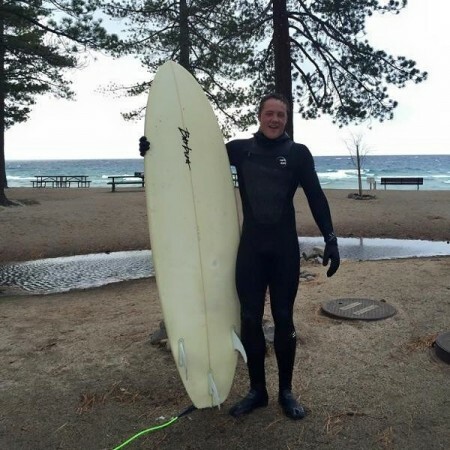 I can’t say exactly why, but surfing Lake Tahoe provoked a lot of interesting feelings and thoughts in me. I was filled with a very peculiar sense of marvel, humor, and uncertainty. I haven’t even been living here for long, but Lake Tahoe is already starting to become somewhat of an infatuation of mine. Saying such a thing makes me laugh, because just about a week ago, a fellow Tahoe surfer told me that it would become a piece of me if I enjoyed it the way that he does. The moment I paddled out, I knew I was going to have to put my thoughts down on paper, so I hope this inspires some to try something new. Hell, maybe you will be convinced enough to jump in the lake next time that Sierra Nevada wind picks up.